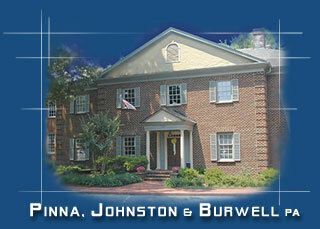 Welcome to Pinna, Johnston & Burwell, P.A., attorneys at law in Raleigh, North Carolina. For over forty years, our firm has delivered sophisticated and innovative counseling to clients in matters of business, estate, tax, and real estate law. We invite you to tour our site and learn about our firm. If you are looking for the highest level of legal service from an established and stable law firm, please contact us. Pinna Johnston & Burwell, attorneys at law, handling real estate, business law, tax law, estates and trusts in Raleigh and Wake County, North Carolina. Also known as: Raleigh lawyer, Wake County lawyer, North Carolina lawyer, Raleigh Lawyer, Raleigh Attorney, Raleigh, Cary, Wake County, North Carolina NC: Estates, Business, Tax, Real Estate, Raleigh attorney, Wake County attorney, North Carolina attorney. Attorney in Raleigh, lawyer in Raleigh, attorney in Wake County, lawyer in Wake County.